1,127,700 had replaced 1,110,100 as Donkey Kong champion Hank Chien's newest high score, adding more proof to the idea that the dude simply can't be stopped. 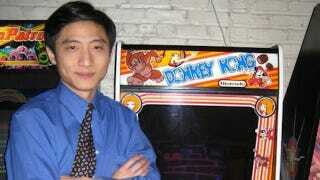 This is, what, the third or fourth time that Chien has beaten his own high score to stay the King of Kong, right? Isn't this guy a plastic surgeon? Aren't there lives for him to improve? Doesn't he want to settle down and have kids? How about at least a vacation, Hank? One that doesn't involve flying a DK machine to some sunny locale? Hank, it's been two years and things have gotten to the point where your fellow DK competitors are asking you to retire. The Kong-Off 2—which gathers the best DK players at one location for glorious live competition—is coming. So, you know what to do, Hank. Don't stop winning, Dr. Chien. Ever. Note: The original headline for this post was A New World Record: Hank Chien Obviously Has Nothing Better to Do Than Play Donkey Kong All Day Long. While it was intended to be playful and tongue-in-cheek, it's been read literally by some readers. That was not the intent, so, to avoid confusion, we've changed it.